How to style a classic pearl necklace for a 18 yo? A reader recently asked me this question in the comments. But I am for freedom of pearls! Therefore I created 4 outfits that make them look fun and not intimidating for an 18 yo ( do not worry you can also wear them if you are older ^^). When something you like looks impressive to wear because it feels like the opposite of yourself, try wearing it with your usual style. If this style is precisely the opposite of the item itself, that’s even better. 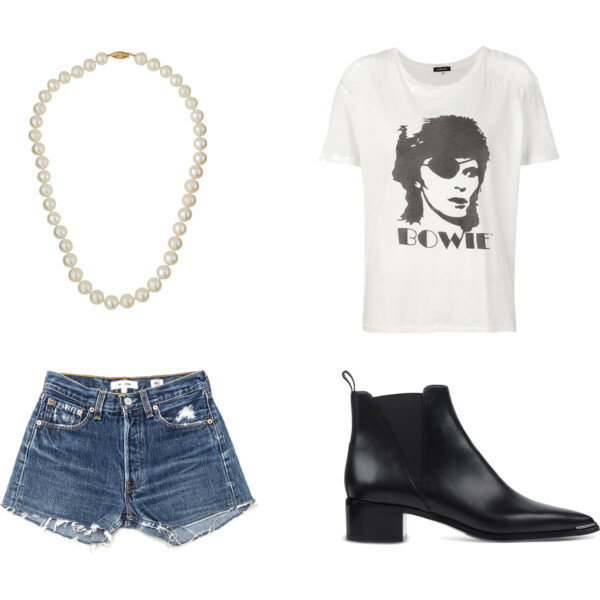 Here I mixed this classic super bourgeois necklace with the typical rock groupie outfit. The printed T-shirt immediately makes the pearl look cool. 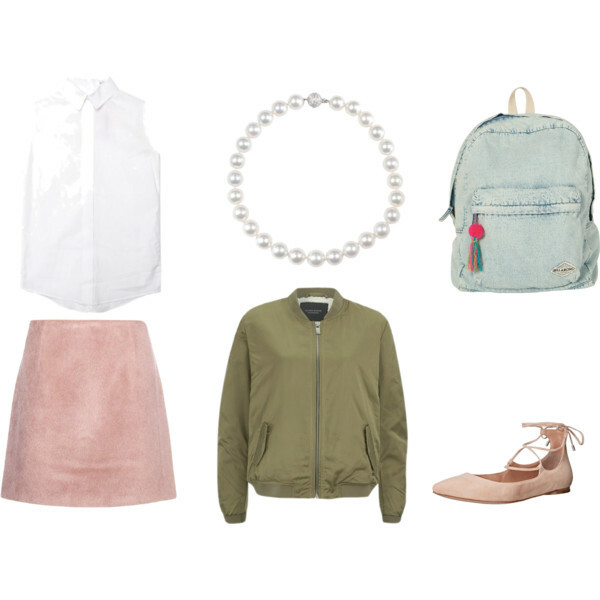 Why not play the game and wear pearls like the good girl you may be? I mixed classic schoolgirl influenced items such as a crisp white sleeveless button-up, an A-line skirt, ballet flats and a backpack. Wear the pearls under the collar for a preppy attitude and make sure you have clean and ironed clothes (pffff I know, high maintenance). The sporty bomber and bag will make the outfit more cool. Wear your hair a bit messy in order not to look too Olivia Newton Jones aka Sandy in grease. 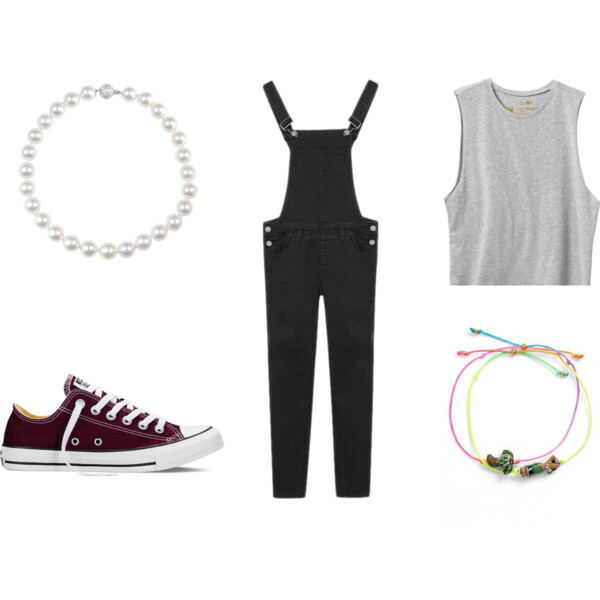 Same as for look number 1: I picked this tomboy style totally opposite to pearls to create a cool style clash. The funky “cheap” boho bracelets show that even if you own grown-up pearls, you are not a boring adult yet. Wouldn’t your grandma be thrilled to see you wearing the necklace she gave you in a ladylike manner? This little lilac dress is girly yet simple. Wear it with some black laced up chunky heels and a velvet bag that’ll give the look a 1900’s ballet dancer attitude. The bright red nails will make the style look more grown up. Really to shine bright like a pearl?